Repeating a basic swing with the proper fundamentals over and over is the best way to fix problems in your swing. Golf students come to teachers with various swing problems that they would like fixed, and most students think there are specific fixes to specific problems. The best way to fix any golf swing problem is to make sure your swing foundation is solid, and the best way to do that is to do the same swing exercise every day until you have your fundamentals memorized. There is no better cure for an ailing golf swing than to have your basic swing fundamentals in place. In order to get your fundamentals in place you need to practice them every day until they are part of your regular routine. Ideally you will want to do this at a driving range so you can see the flight of the ball after you strike it, but your backyard will do if you cannot get to the range. Take one of your golf clubs and lay it on the ground. If you are at a driving range, lay the club down so that it is pointing in a straight line at the range targets. Line your feet up with the club so that they are shoulder-width apart and straight in line with the club on the ground. Place the ball on the ground to the spot where it would be in your normal stance. Make sure you are using the interlocking grip, where the index finger of your top hand is interlocked with the pinkie finger of your bottom hand and both of your thumbs are pointing in a straight line down the golf grip. Extend your arms and, with your back straight, flex your knees until you are able to address the ball comfortably. You are now in a perfect golf stance. Practice this a few times until you get the right feel for getting into a proper stance. Slowly draw your club back, with your hips and knees following the path of the club. Keep your left arm straight if your are right-handed and your right arm straight if your are left-handed. Continue to bring the club slowly back until your hips are coiled back with the club and the club is parallel to the ground and over your head. Keep your head down and your eye on the ball. You have now executed a deliberate, perfect back swing. Practice this a few times to make sure you always do it right. Start to bring your club down in concert with your hips and knees. Your feet should always remain planted where they are, shoulder-width apart. At a nice even pace, and with your head always down and your eye always on the ball, bring the club through the ball and make contact. You have just executed the perfect down swing. But don't stop yet. You have to follow through before you are finished. The final step is the follow through. Continue to keep your head down and bring the club through the ball, staying on the even and straight path you started with your down swing. 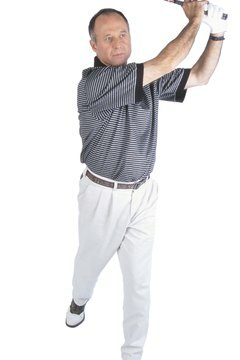 If you are right-handed, continue to bring the club around until it rests on your left shoulder. If you are left-handed, the club will rest on your right shoulder. Your head should comfortably follow your arms through the swing, and you should be looking straight ahead when your follow through is done. The follow through is extremely important, so be sure it is always the final part of your practice swing.